Fleas in the home or anywhere else can be easily treated and effectively eradicated without the use of poisons and harmful sprays. 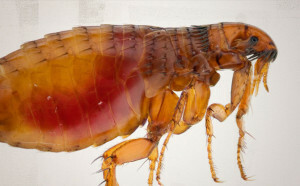 The age-old fleas, usually associated with pets like dogs or cats, can affect any home. In that cases chemical-based flea treatments can be more effective and we use only those pesticides and Growth Regulators (That control the growth of Fleas )that are approved from health Canada. Exopest fleas control house treatment is very effective and If the fleas come back, just contact our experts and we ensure you complete removal of fleas. Flea bites on people cause distress as your pets suffer much more. You often notice that your dog or cat scratch frantically and trying to bite the fleas in their fur. A flea bite is not painful, but you will be aware of it as soon as you have been bitten. You may feel some itchiness around the bite, which could become uncomfortable but it is depending on your sensitivity. Flea bite is look like a spot, which is small in size. Flea bites appear as tiny red spots on the skin. It is difficult to identify flea bite just by looking at your bites. You should consider other different factors, which help you to identify your problem. Our Exopest technicians know exactly what to do and when to do with their fleas control natural treatment using fleas control products. Our experts understand the habits of different fleas and can offer you the most appropriate and effective solution for fleas control in house and offices. It goes without saying and hesitation that all our fleas control and pest control treatments are safe for your family and pets. Most of the time Pets can cause fleas and pets can pick up fleas from other animals or different places and give them a ride home. That’s fact, once they arrive, you’ll want to get rid of them fast and for that purpose Exopest play an important role. Call us any time regarding fleas control. Call Exopest, The pest control Professionals 604-760-1542 and we’ll arrange an appointment so that you can get rid of fleas from your home.